2013 is, suddenly, over and done with. What did you learn? Do you have a plan for your business’ blog in 2014? Yes we’re still arguing about this, but I’ll throw in my two cents and you can agree or disagree in the comments below (in fact, I encourage it). Great content is better than a great amount of content. And it’s easier to write great content if you’re writing less than ten articles a week. An awesome 1000 word-article is better than a boring 2000-word article. And publishing awesome content four times a week is better than publishing bad content eight times a week. Earlier today I wrote a guest post for FBPPC on the new Facebook Video Ads. The ads are a very new development in social media marketing and the information on them is pretty minimal. The article ended up about 1200 words. Yes I could’ve kept going, but it wouldn’t have added value to the article. And I bet I would’ve gotten a hit in the performance and virality of the article if I had. Your article should be as long as it needs to be – and no longer. If you’re writing a comprehensive guide to Facebook Ads your blog post will probably end up being more than 2500 words, because otherwise (in my opinion) you’d be leaving something essential out. Conversely, if you’re writing an article on the new Twitter conversion tracking tool, you’d be hard pressed to get 1000 words. This is because the tool is so new (18th of December), and there’s so little information and no case studies as yet. More important than anything else, though, is formatting your blog for your reader. Blog readers skim. They want to know the main lessons of your article quickly. This means sub-headings, bolding the important takeaways, short paragraphs, bullet-points and (my personal favorite) something like a ‘what this means for you’ section. Think of your blog article as a turkey dinner. Once you’ve had the main meal (and it’s amazing, don’t get me wrong) you have the leftovers still to eat. Who doesn’t love the day-after turkey, stuffing and gravy? Or the cold pumpkin pie or turkey soup? Slideshare presentations, infographics, webinars, social media posts and ebooks are the leftovers. The research you put so much time into for a blog article shouldn’t be wasted. Take the statistics from a couple blog articles and compile an awesome (and visually appealing) Slideshare presentation. Write five articles on the same topic and create a comprehensive ebook. The list goes on. Here’s an example: I recently wrote a series on the psychology behind a successful Facebook Ad. I spent a whole day researching how we are unconsciously influenced by colors, image and text, and how this impacts online advertising. This research turned into three awesome articles, three Slideshare presentations, an interactive infographic, an ebook, comment-fodder for my influencer marketing efforts, social media posts, as well as being used and cited more than 10 times in the articles I’ve written since. Are you still spending as much time optimizing your blog for SEO as you are writing? Are you scavenging the web for ways to build more links because you think that’s what it’s all about? Well, stop. Since Google integrated the Hummingbird algorithm in August there’s been a decrease in the power of link-building. It’s changing the way we think about SEO. The focus for 2014 will be on SMO (Social Media Optimization). Up until now, Google thought of links to your content as votes in how important that content was – hugely influencing whether or not your content was seen. Now, however, Google is rating social shares as equally important. In fact, Moz’s SEO factors have found that Google +1’s (unsurprisingly) are more important than any link building you may have previously pushed for. Focus on making your header images attractive and eye-catching, so they’ll look good in a Facebook post. Be sure you’re using Bitly links to make your content Twitter-friendly. If you’re not already, you need to include a social share toolbar within your business’ blog pages. This can increase the virality of your content by up to 700%. So yes, it’s important. Struggling for engagement? Is it because you sound the same as everybody else? Are your posts unoriginal, your titles blah and your facts and statistics nothing new? Focus up, people. It’s 2014 and you need to put some effort into your blog persona to succeed. A blogging persona is something that sets you apart from the other million brands struggling to get original content to their target audience. A blogging persona increases the virality of your content as people are more likely to comment (which is valuable in SEO). Try a weekly themed blog post, like #WednesdayWarnings – which could keep people up to date about changes in your sector. Remember to make the theme hashtag to increase shareability, virality, and the reach of your content on social media and Google search. Try a humorous or creative mascot for your blog. Think Andrea Vahl’s ‘Grandma Mary’ or Social Media Examiner’s cartoon explorer. Test out new and different titles. Forget SEO for a second and focus on eye-catching, controversial, or intriguing titles. Focus on awesome and eye-catching images that get you noticed. Put time and effort into it. There’s a bunch of new and free photo editing tools (if you don’t have Photoshop). Try them out. 2014 will be the year that influencer marketing really shoots up as a part of a blogger’s daily responsibilities. Influencer marketing is the strategy of creating a relationship with an influential thought-leader in your sector – and through them increasing your own business’ influence online. Find your industry leaders. Try the top 3 social influence metric sites: Klout, Kred and PeerIndex. These sites determine the reach of an individual’s online presence. 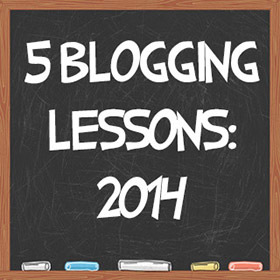 Hopefully you can use some of these lessons in your 2014 content strategy sessions. Remember to emphasize social in your blogs, get creative to stand out from the crowd, and don’t be afraid to reach out to powerful and influential thought-leaders in your sector. Have you integrated these strategies into your business blogging strategy already? Have you had success or frustrations? Start the conversation below! About the Author: James Scherer is a content marketer for Wishpond and author of the ebook The Complete Guide to Facebook Ads. Wishpond makes it easy to run Facebook Ads, create landing pages & contests, email automation campaigns & manage all of your business’ contacts. Wow.. this blog post is FIRE!! So I learned so much I don’t really know where to start.. yet the idea of bringing quality content vs. the quantity of content.. I agree completely. There came a time when I felt like I was just throwing stuff out there. Ok.. my big take away is the “what does this mean for you” section..
Ok.. wait there is another big take away.. I now understand how to connect with a social media influencer. So glad you enjoyed it and found value. I still haven’t tested the weekly theme, though I love the idea too. If you try it out I’d love to hear about it! Thanks for reading! Great blog post. 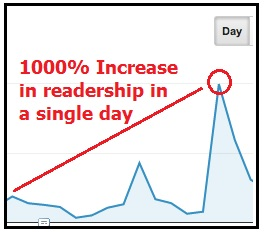 Lots of valuable information and suggestions for increasing the value of my blog posts. I love your analogy of a Thanksgiving dinner with all the leftovers to be enjoyed. Also, I have known about Klout but I never heard of Kred or PeerIndex before. Thanks for sharing this.